Bulimia as an emotional disorder involves an obsessive desire to lose weight, and a distortion of body image, in which episodes of extreme overeating are followed by self-induced vomiting, fasting, or purging, which may also lead to depression. Bulimia as an eating disorder is defined as consuming a large quantity of food in a short period of time, followed by feelings of shame, and/or guilt. Regardless of whether it is an emotional disorder, or an eating disorder, bulimia effects on the body are devastating. Being hungry: Because bulimics refrain from eating for long periods of time fearing weight gain, many are in a constant state of perpetual hunger, which increases their risk of losing control. Others develop a fear of eating, with the mistaken belief that eating food is somehow unhealthy for them. This hunger is magnified by a drop in blood glucose levels resulting from a lack of nutrition. Feeling low: Body image is a person's perception of their physical appearance and how they value themselves. People with a poor body image have a distorted perception of the way they look, and will tend to compare their bodies to others. This can lead to loneliness, anger, anxiety, depression, and a sense of self-worthlessness that often leads to depression. Situations: Dieting in order to lose weight is a common response to people's ideal images. However situations arise at social events where the dietary restrictions are broken, leading to what's referred to as yo-yo dieting. Yo-yo dieting is when people start a diet and lose weight, but gain it all back, and continue on with this unhealthy pattern over a long period of time. Weight obsession: Some people may have a distorted body image, and an intense fear of weight gain, believing they are very overweight.Their diets may include, avoiding particular types of food, restricting the amount of food eaten, and/or skipping meals for long periods of time. This kind or dieting is very dangerous and can result in permanent damage to the body. Because bulimia is a disorder that is characterized as a person possessing an overwhelming urge to overeat, there is usually a heightened sense of tension just before a binge, and it is released as soon as the first bite is taken. While engaging in binge eating, the bulimic gets comfort from the foods they have consumed. Most of them get immediate relief from hunger, and they feel full of energy, and able to continue on with their lives. However, these individuals also have a morbid fear of becoming overweight. After a binge eating episode, the bulimic has severe guilty feelings of losing self-control, and the relief of tension may be soon followed by a sense of despair. After succumbing to an episode of binge eating, bulimics may feel disgusted with themselves, thus worsening their depression. Overeating is then followed by self-induced purging, excessive use of laxatives, or vomiting. The methods of purging vary in technique, but some people find vomiting easy and spontaneous, lasting only seconds. For bulimics, purging becomes a way of controlling a binge. Others will use laxatives, but like vomiting, laxatives are ineffective for weight control. Unfortunately, until the binging behavior is under control, weight loss efforts are unlikely to be successful in the long term. She is seen becoming extremely malnourished. Note the atrophy in her arm muscles, and the hollowness in her face. Without immediate intervention, this girl may starve herself to death. This once strong and athletic man is literally starving himself to the point of impending death. 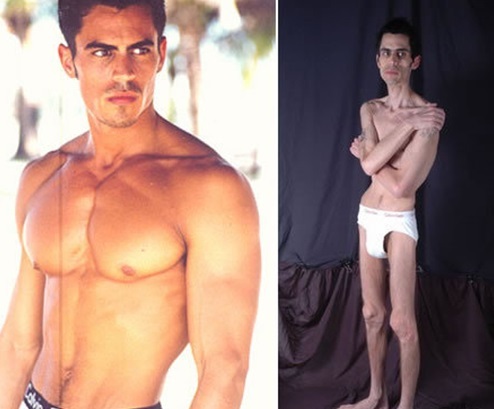 The bulimia before and after photo shows his emaciated body is reminiscent of Holocaust survivors that were starved during WW II. Losing too much weight too fast is yet another sign of bulimic behaviour. 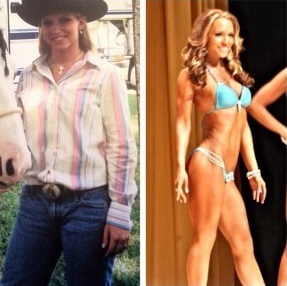 In this photo the young woman has lost a total of 20 lbs in less than 3 months. If you look a bit closer, you can see her hollow cheeks and the beginning of atrophy in her arm muscles. If beauty is in the eye of the beholder, this photo shows how pressure from social events can influence others into thinking this looks healthy. It’s not! Trimming down this much is extremely dangerous to vital body organs. There are several ways to treat bulimia. However, combining psychotherapy with antidepressants has shown to be very effective in helping people overcome the disorder. Cognitive behavioral therapy helps people identify unhealthy, negative behaviors and beliefs, and replaces them with positive, healthy ones. Family based therapy helps parents intervene to stop their children's unhealthy eating behaviors, and helps the child regain control over their own eating habits. It can also help the family deal with the problems that bulimia can have on the child's development and the family as a whole. Interpersonal psychotherapy addresses difficulties in people's close relationships, helping them to improve communication and problem-solving skills. Antidepressants can help reduce the depression associated with bulimia along with the psychotherapy. Fluoxetine (Prozac) is the only antidepressant specifically approved by the Food and Drug Administration to treat bulimia. It is a type of selective serotonin reuptake inhibitor (SSRI), which helps even if you're not depressed. Your healthcare provider and dietitians can design a meal plan that can help you achieve normal eating habits, a healthy weight, and good nutrition. Some people with bulimia may also benefit from a medically supervised weight-loss program. After seen the bulimia before and after pictures, hope you can adopt a healthier life style.